Once again a hint of Caribbean cruise, this time aboard the transatlantic ship, Pullmantur’s Monarch ®. This was the second cruise I did, I have spoken here of the Majesty of the Seas Royal Caribean which is also very good. Be sure to check out the tips and if you’ve never done a cruise take a look there because this Royal is well short of 3 nights, good for those who want to try a cruise for the first time. This time, I chose a cruise a little bit bigger and with a different script. We did the 7 nights cruise passes through the West Indies and Southern Caribbean. The script is Cartagena (Colombia), Aruba, La Guaira (Venezuela), Curaçao and Colon (Panama). We left the city of Cartagena, but it is possible to embark on any one of them. A difference of this cruise compared to the Majesty of the Seas is to board the Monarch is not need any type of visa, you only need your Passport. This is one of the advantages to those who want to make an international cruise. Once again it was a great experience and say that I intend to make other cruises. It’s addictive. Take a cruise is like being in a hotel on the sea. You enjoy the entire structure of the place (swimming pools, theaters, gym, sauna …), the food and drink at the end of the day do you sleep and when you wake up is already elsewhere. You can go down, knowing the place and go back to the ship to enjoy all over again. Some people are afraid to make cruises as many people report that go wrong with the ship rocking. In my first experience had no problem with that. In this second in a few hours I could feel so much the swinging ship but nothing that got in your way. It should depend on a lot of the place and the weather. To ease some the sense of balance seek travel in cabins that are kind to the Stern (rear) of the ship. Check out some more tips on this cruise. As stated earlier the cruise passes by Cartagena (Colombia), Aruba, Curaçao, La Guaira (Venezuela) and Colon (Panama). He does this path without stopping and that’s why I always have people starting and ending the cruise in every port. The bad thing about this is that you don’t have a correct order of the ship’s activities. For example, the next day I did the last day the entire crew would fire before both the dinner as theater presentation. In this presentation happened in the middle of the cruise. The day to day inside the ship is very informal, bring light clothes, sports and casual attire. Swimwear and slippers. In restaurants you can’t get in without a shirt or barefoot. During the night outside is cold, light jackets and sweaters of cold if you want to be walking around out there. In gala evening the captain presents the crew and the ship. Recommend a more formal outfit. It is not mandatory. You can take a picture with the captain of the ship, but obviously you have to pay. And it’s not cheap. This cruise had the white day. We didn’t know but luckily we had taken white clothes. He also had and parties of super heroes. Some people were in costume. Find out if any event of this type will occur if you want to participate in a costume. We thought it would be the same as at the port of Miami and arrive early to try to enjoy more the ship but lost time as boarding took too long and only happened after the schedule. We had to wait in a huge line that went around and around. So don’t get too early because boarding is only done after all the other passengers who are ending the cruise ship landing. To the port of Cartagena the shipment was scheduled for at 4:00 pm. We arrived before the 1:00 pm and we can only enter the ship almost to 5:00 pm. We hadn’t had lunch and we had to have a snack in the own port. Recommend lunch before going to avoid abusive prices. The first thing to be done coming in the port is stamp the passports. Then you need to fill out some forms. One of them is for a deposit of $ 200 must be made. If you consume something will be charged this amount. If not, will be returned to the end. You can pay in cash or credit card number. Another form that you must fill out is about health issues. If you’ve ever been in some certain countries in recent weeks, etc. They give you tags that should be put in the trunk for identification. After that is go to the queue and wait. Many people leave their bags in the queue and come out but they don’t recommend it. After a long time the queue is released and therein begins the boarding process. The bags go through an x-ray and you are freed to enter the ship. The ship gets a little away. You can wait for a bus that will take you to it or go on foot. The distance is not great and is faster walk than wait for the bus. The luggage is placed in front of the cabin. It took to put her there. To seize the ship and no waiting around, take a Briefcase with the bathing suits, flip-flops and other parts that you want to use until the arrival of the luggage in the cabin. There are 3 types of cabins. Without internal, external window with Windows and suites with balconies. This time finamos on inner cabin because they are the cheapest. We’ve had experience of staying in the cabin outside with window and I confess that I felt a lot of lack. The booth is small but has everything you need, except the refrigerator. The cabins have safes that can be used free of charge. Also has a hairdryer. The drinks are charged. There are a few packages that can be purchased and entitle to unlimited beverages. We were lucky enough to buy the cruise and make the drinks package and didn’t have to worry about anything. This package includes both non-alcoholic beverages as alcoholic beverages. You can buy this package in their own ship and also upgrade that entitles you to other brands of drink in addition to Whisky and energetic. The package is purchased by cabin and the control is done through a bracelet. The power supply is included in the package. Various meals are served during the day (breakfast, lunch, dinner and snacks). Pizza released. For dinner in the à la carte restaurant must comply with the schedule that is marked on your boarding pass (which is chosen at the time of purchase of the cruise). It is possible to talk with the Chief of the waiters and change the time if you do not like. Dinner in the buffet restaurant is free of timetables. Depending on the time usually give a line, especially where the meats are served. The tips are optional. I was so well treated by some officials who decided to leave. In this case, I delivered in hands and on the last day of cruise. Gave some dollar to the valet. He always asked if we wanted something, and the room was always clean. Our class also gave a present to the waiter and Assistant waiter who attended us every day. They were super happy. Buy a doll of Mario Bross as the bartender’s name was Mario. We stayed there for 1 week before the cruise but if you want to meet her in just 1 day highly recommend walk the walled city. Take a taxi from the port to the historic centre. Taxis there are super cheap. 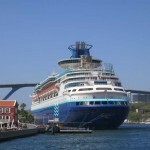 It is not necessary to guide or buy a specific ride offered by the cruise. I recommend starting with the Torre del Reloj. You can go walking through the little streets and houses filled with flowery balconies. Also to stay on top of the wall. Go to the store known as Las Bóvedas to buy some souvenirs. Go to the Cafe Del Mar which has a super cool views, although the law is going to night to enjoy the sunset. Another nice trip to do is visit the Castillo de San Felipe de Barajas. Only the castle is a little further away from the Center. Buy a ride offered by the cruise. We went to Palm Island. Is a very small island. Is included in the food, drink and ride the whole site structure as chairs and sun loungers. There also has a small water park. Is also included the banana ride, a Pogo jumps on the trampoline that I don’t know the name and the equipment to do snorkeling where you can stay as long as you want. Also have salsa class among other activities. If you don’t want to go to the island another option to move the submarine ride. I don’t have time to do both. In Venezuela we decided to risk it and instead of buying one of the tours offered by the ship bought with one of the thousands who were agents waiting at the port (was much cheaper). The ride up which was nice but honestly would have been better to stay on the ship. We went to Caracas and on the way there you see a lot of dirt. We rode the cable car (which by the way was one of the greatest I’ve ever got). Then they took us to a place called Paseo Los Próceres (which is beautiful, green area and a huge monument). We stayed a short time. Then we were at the mall that was close. Amazing how the money yields. With only 5 dollars exchanged in local currency and we can eat and still buy some souvenirs. In Curaçao also bought the ride with a foreign agent. It was a very helpful by the way. Spoke including Portuguese. Did a city tour and then she left us on the beach at Mambo Beach. On schedule she sought and brought back to the port. Still had time to walk in the surroundings. Very nice city. The houses are all colorful. We went to the Panama Canal. Very cool to see the engineering of the whole thing. There’s always a ship passing by. By the way have to queue. Then surely you will view the locks opening and closing. The whole process takes less than 30 minutes. Then we went to the Catún free zone. We had the misfortune of being a holiday and 90% of the shops were closed. Still gave it to enjoy and buy a few things.